Our Master's degree in Public History will prepare you for a career in the field of History and Public Heritage or for further study at doctoral level. Most people's sense of the past comes from public history, through film and television, fiction, museums, heritage sites and memory work. This course looks at the kinds of pasts that are produced in these popular forms. It examines how they are made and the ways in which they are consumed and understood. As part of your study you'll be able to gain practical experience of working in a cultural heritage site, museum, gallery or archive. The degree will help to prepare you for a career in public history related fields. It will also show you why the uses we make of the past are not just matters of academic interest. This is the only degree in the UK that is taught, in part, at The National Archives, which is a leading national and international site not just for archiving government documents, but also for engaging with the past in other ways. You will attend workshops at The National Archives, delivered by their highly experienced staff and drawing on their wealth of original materials. The St Mary's campus is located in South-West London, meaning we can offer you excellent opportunities for field visits, and unrivalled links for volunteering and work experience with Hampton Court Palace, Strawberry Hill House, Turner's House, Sir John Soane Museum and Orleans House Gallery. This means that if you decide to take a professional attachment as part of your degree, we can arrange a placement that is relevant to your interests and career aims. The degree is taught by historians with a strong record of publication and high-quality teaching. Our graduates have gone on to work in archives and heritage sites, as well as undertaking doctoral level study. Includes sessions taught by the Public History Team at the National Archives. Will prepare you for a career in the field of cultural heritage or for further study at doctoral level. Taught by experts in the field working in the Centre for the Philosophy of History. Taught on our historic Strawberry Hill campus. To qualify for entry students should normally have a second-class degree or relevant experience. The degree must be from a UK or overseas university, or the equivalent. Candidates with professional qualifications in an associated area will also be considered. Having a strongly vocational focus, this module will give you opportunities to engage with, and test, models of the presentation of historical knowledge through practical experience of a number of prominent heritage sites and spaces in the West London area, all proximate to St Mary’s University. These sites include Strawberry Hill House, Ham House, Orleans House, Richmond town centre, Marble Hill House and Sion House. You will visit these sites to observe and critique their current presentation to the public, engaging with issues such as the constructed narrative of the building/site; its ‘preferred’ meanings and significance, how particular spaces within it are presented in light of that narrative and to consider alternative constructions of the past which might be offered through its physical remains. You will attend a taught session in The National Archives in which you will consider TNA as a research resource for aspects of 'local' history, with support training in various record series. You will also discuss TNA as a research resource for heritage policy, such as records of the Historic Buildings and Monuments Commission for England (English Heritage). Please note: there may be additional fieldwork costs for this module. This module will introduce you to the socio-political and epistemological processes by which historical narratives are produced, the contexts in which they are consumed and the functions they serve. You will read and discuss histories that have been constructed using a wide range of formats – not just academic histories, but graphic-novels, films, historical fiction, oral histories, exhibitions, monuments and representations contained in memory sites. One important theme that threads the module together is a consideration of historical discourse’s potential to work as a democratic and empowering ethico-political resource. The module will examine the ways in which we remember and commemorate the past. Using specific case studies, which might include the First World War, the Holocaust, 1968, the 9/11 attacks and the 'Troubles' in Northern Ireland, you will engage with the ways different cultures remember and shape the histories of their pasts. It will also interrogate the ways that collective memory translates into public commemoration, and we will think about the role of the public historian in communicating and constructing contested histories. The 'sites of memory' at which groups remember their pasts, such as museums, memorials, literature, buildings, national commemorations, and debates over the past, will also be examined. In taught sessions at the National Archives you will discuss the role of the archive in public commemorative programmes, and the role of archives in preserving and communicating histories to expert and non-expert audiences. To complete your MA you must either write a dissertation or do a professional attachment (but not both). This module provides an opportunity for students to learn from professional practice activities on a part- or full-time basis through an attachment at a partner organisation in the archival, historical or cultural heritage sectors. It gives you an opportunity to undertake a research or organisational task in which you can relate your theoretical knowledge of public history practices to the realisation of these practices in a vocational setting. The aim is to produce a piece of work (e.g. report, short-film, website, plans for execution and documentation of an event, educational package, museum display) that is of benefit to the partner organisation and may form part of the School of Arts and Humanities research culture. You will also be expected to reflect critically on the professional attachment in the form of a viva. This core module will examine the production and function of public histories, using case studies drawn from a range of local, national and transnational spaces. You will investigate the relationships between public history and topics such as memory, archives, identities, nostalgia, heritage, power, and nation-building. We will pay attention to the most popular forms of history produced by the wider public – family, local, military and house. We will also discuss the commercialisation and commodification of historicisation within the spheres of leisure and entertainment. At a taught session in The National Archives we will consider the role of archives (national and local, official and unofficial) in the production and distribution of historical texts, artefacts and discourses. Alongside this, we will discuss the role of states and non-governmental organisations (NGOs) in the production of widely shared narratives about the past, and their role in facilitating the production of certain forms of historical knowledge. Field visits will be used to explore the organisation and function of the museums, galleries and heritage sector. You will also receive initial training in the skills required to produce public history materials (e.g. short film, website, history blog, display, oral interviews) for an end of module exhibition. To complete your MA you must either write a dissertation or do a professional attachment (but not both). This module gives you an opportunity to undertake a sustained piece of academic research on a topic developed independently but with supervision, including a Research Brief (2,000 words) and culminating in the submission of a 13,000-word dissertation. You will be guided by your supervisor to develop an appropriate bibliography. You will have regular meetings with your supervisor to discuss progress on the project. You will also be expected to submit draft chapters to your supervisor for comment. Depending on your choice of topic, you may have a dissertation co-supervisor from staff at The National Archives. Recent graduates from the course have found work in archives and the course is designed to help students find careers in fields such as heritage, education and the media. It will contribute to the professional development of people who are already employed in these sectors. It will also provide a critical and methodological platform for students who wish to progress to doctoral level research. One of our MA Public History students, Catharine Williams, undertook a work placement at the National Archives and has recently published a blog about conscientious objectors in Twickenham in the First World War on their website. Modules will be taught using a variety of modes – classroom-based discussions, field work, distance learning, work placements (where appropriate). This course is designed to help you find a career in fields such as cultural heritage, archives, education and media. It can be used as part of your professional development if you are already employed in these sectors. It will also provide a critical and methodological platform for you if you wish to progress to doctoral level research. You will write essays, produce project work, critique different types of source material, and learn to create work using a variety of digital tools. You will also design and deliver presentations about your work. In order to complete the MA, you will produce an extended, independent research project. This will either be a project based on your work placement or a text-based piece of academic research. Additional costs could be incurred depending on optional modules chosen and other projects undertaken For further information about additional costs please contact stewart.mccain@stmarys.ac.uk. 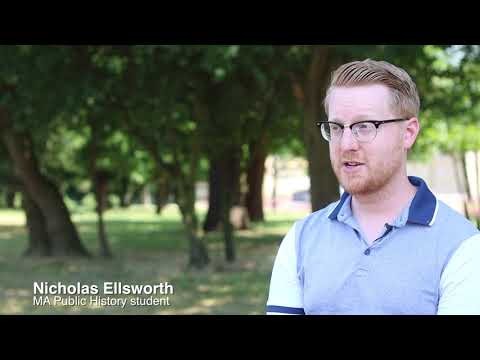 Start your application to study Public History.